You wanna see people in Southwest Michigan freak out? Open a Popeyes. Seriously. 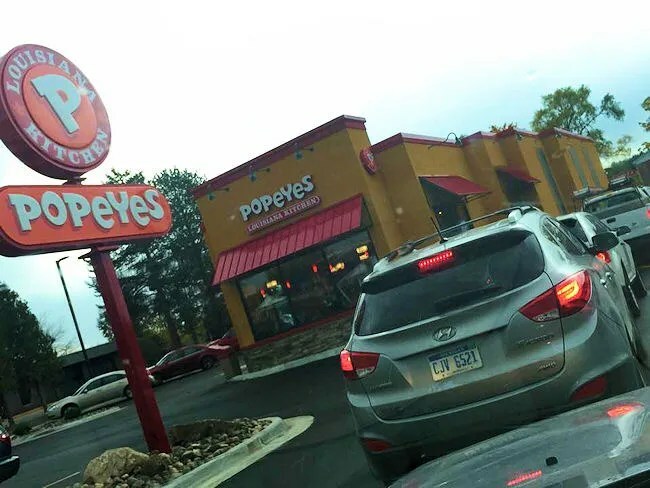 Popeyes opened their first store in Kalamazoo in over five years about ten days ago and the mass chaos surrounding the new store has caused back ups on West Main Street and even re-routed Metra buses in the area. It’s kind of ridiculous. J texted me before she came home from work and asked if we had a frozen pizza in the freezer to make for dinner. We didn’t, but I suggested running by Popeyes to see if the hysteria had calmed down any. It hadn’t, but she decided at that point that she was hungry and now, thanks to me, craving Popeyes so she just got in line and waited. Popeyes Louisiana Kitchen built a brand new building on West Main Street between North Sage and Northampton Road. To be a little more specific, it’s across the street from Little Caesars and next to (sort of) The Hangar. J said it took about 15-20 minutes from the time she pulled in to the drive thru line to the time she had a bag of food and was heading out. She thought about just going inside, but the parking lot was full and the line inside was out the door as well. She figured if she was going to wait, she may as well do it sitting down in her own car. When she got up to the speaker, she put in an order for an 8-Piece Bonafide Meal. The meal comes with one large side and four of the insanely delicious buttermilk biscuits. She let me chose the side and we got the Cajun Fries. For L, she was going to order a kid’s meal, but those only come with one chicken tender. Some days, L eats six chicken tenders, so to be safe, J ordered her a 3-piece mild chicken tender combo. 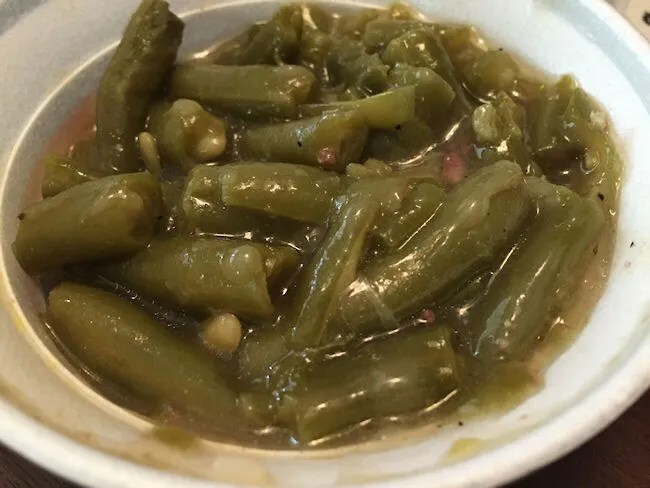 With the combo, she got a Diet Coke and green beans for herself and three tenders and a biscuit for L. The cost of all this came to around $30. When J got home, I grabbed the bag from her and started digging in before she could even get her shoes off and sit down at the table. I really like Popeyes. It’s one of the few fast food chains that I will readily admit that. I don’t like anything enough to wait in line for an hour, but even at the Grand Rapids and Battle Creek locations, the lines are always insane. It seems like you can never hit up Popeyes during a down town. I started with the Cajun fries. I didn’t realize she was getting a meal with a large side. There’s a lot of fries in a large side. I ate most of them on my own, but J did take a few. 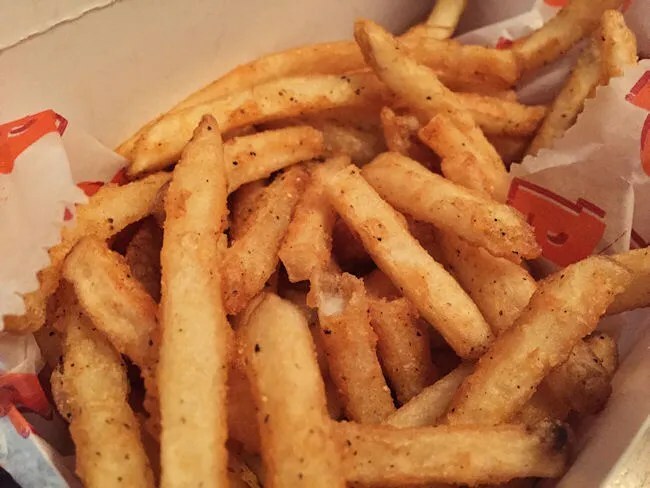 The fries at Popeyes are thin, crispy fries that are tossed in a Cajun seasoning. I think they’re good enough to eat on their own and don’t understand how or why people dip them in ketchup. Once I came to my senses and noticed the box of biscuits, I reached in and grabbed one. Again, I love them as is. No honey for me and most people think that makes me really weird. J has to have the honey, but dangit, I think that makes her weird. 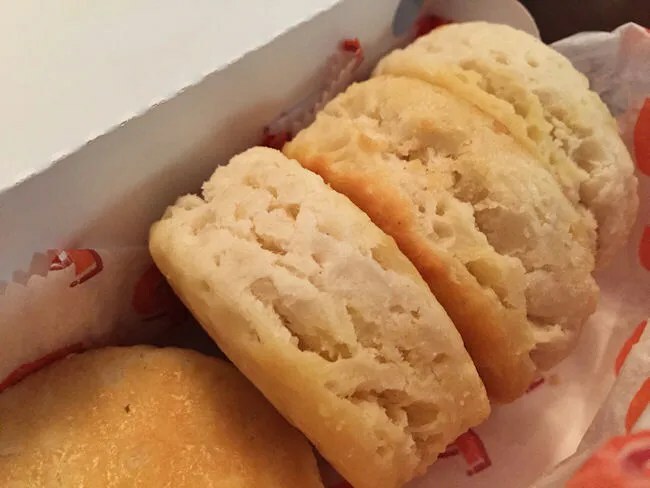 The biscuits are so flaky and buttery on their own, they don’t need anything. I’ve always said if I had a deserted island food, Popeyes biscuits would be one of them. With all the sides out of the way, I started grabbing chicken. J had thought that she ordered all white meat, but we got both white and dark in the box. That’s not a really big deal as I don’t mind the dark meat. I like the white meat better, but I will eat the dark meat and that’s what I started with because J will only eat white meat. We always order the spicy chicken from Popeyes. It just has so much more flavor and it’s really not all that spicy. I used to work with a woman from Baton Rogue who always said the chicken was spicier back home. I don’t know if that’s true or not, but I know the chicken we get up north won’t burn you mouth, but the spiciness does add a great deal of flavor to the chicken. As we were eating, J kept remarking at how little meat their was on each piece. Most of it was just breading and when it came to L’s chicken tender, it was about 90% breading. I couldn’t argue with her and I have noticed that in the past. 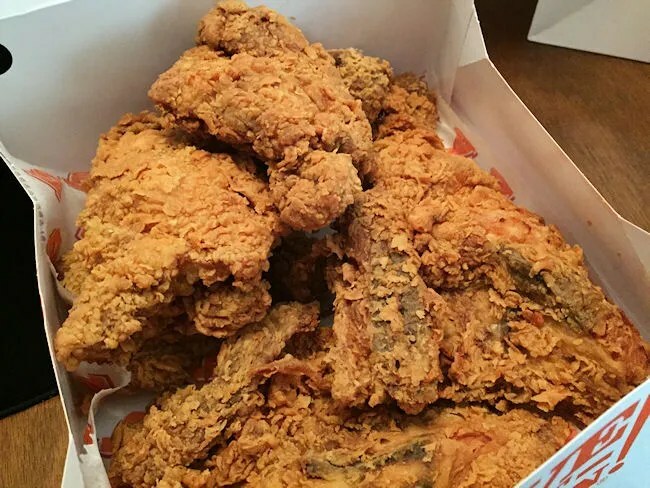 You don’t get a lot of meat with Popeyes chicken and that’s really too bad. The breading is so damn good it would be nice if it was covering big juicy pieces of chicken, but that’s probably how they keep prices down when compared with some of the local places that charge quite a bit more for the same size meal with bigger chicken pieces. All in all, I am really, really happy there’s finally a Popeyes in Kalamazoo again. 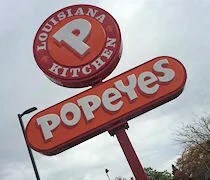 The one on Gull Road was long gone before we ever moved to town, so in the six years that we have been in the area, there was no Popeyes for us to lean on when we wanted chicken for dinner. It’s a place that has it’s flaws…but it is a giant fast food company, so that’s to be expected. As long as you know what to expect when you walk through the doors, you will be happy with what you come away with. I don’t see those long lines going down anytime soon on West Main, so I can’t be the only one who is happy to have Popeyes back in town.